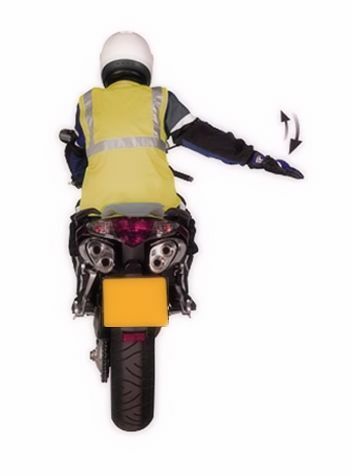 Motorcycle directional indicators are very close together often making them difficult to see for other road users. This becomes especially difficult under bright sunlight. If you think your indicator light may not be clearly seen, ensure your intentions are better seen by other road users by giving an arm signal. This offers a much more visible signal, especially if done whilst wearing florescent clothing. Signalling either via arm or directional indicators should be done in good time to offer other road users time to see and react accordingly. 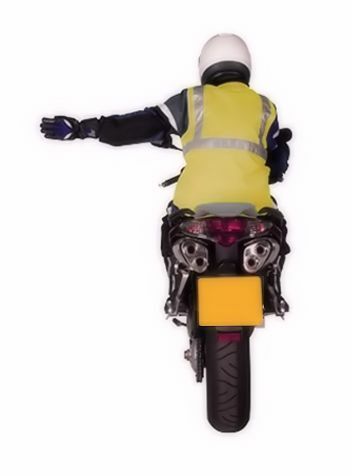 See when to indicate on a motorcycle for further information regarding the use of directional indicators. Generally safer to use a slower speeds, you may consider using arm signals where bright light may make it difficult for other road users to see your directional indicator. To ensure following traffic understands your intentions, consider using an arm signal at pedestrian crossings. An arm signal requires removing one hand from the bars, which in turn reduces steering control. When traveling at speed, use only directional indicators. If using an arm signal to show your intention of changing direction, only use the arm signal whilst traveling straight and not whilst making the turn. 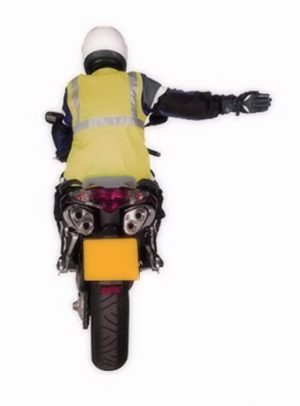 Using arm signals is not a substitute for having faulty directional indicators. If your motorcycle has directional indicators, the law requires that they are in a suitable working condition for use on public roads.